You can also think of rug pads as bodyguards for your floors. When placed on hardwood flooring for an extended period of time with no pad, a rug can cause scratches and other damages. 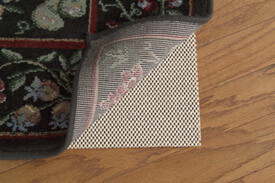 A rug without a pad also has the potential to damage a tile floor, so we recommend a pad for use on tile as well. If you’re placing a rug over wall-to-wall carpeting, a pad is not entirely necessary. It can, however, help keep the rug in place—on carpeting and any other type of flooring. 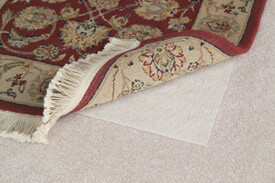 A pad’s “gripping” action not only keeps the rug where it should be in a space but also helps prevent slips and falls. Rugs on hardwood, tile, or other non-carpeted surfaces can slide around easily, and they “walk” when on top of carpeting, creating raised areas of the rug that can be very hazardous and may cause someone to trip. A pad provides a little extra cushion for added comfort when walked on, too! At Rug & Home, we carry and recommend rug pads by Leggett & Platt that are made of an environmentally friendly organic polymer. Most pads sold in big-box home stores are made from latex, which, over time, can break down and damage your flooring. Leggett & Platt’s pads carry a 20-year warranty and promise that their patent-pending construction and materials will not break down. So, show your rug some love, and protect it (and your floors) with a pad! Stop in any one of our stores and ask a customer service associate to show you our nifty ‘rug pad board’ to see and feel samples of the various types and thicknesses we carry.